Nadiya Kysla aka PUPPET GIRL approaches the end of her first year with the GOON SQUAD. 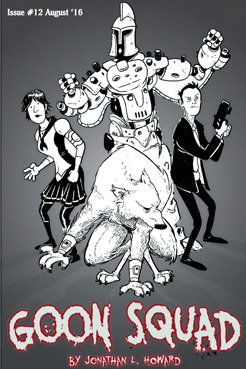 In that time she has fought organised crime, nearly died at the hands of an angel, faced off against an ancient serial killer, and found real friends, even if one’s a corpse, one’s a werewolf, and one’s a robot. Now, as that year draws to a close, we follow her and her colleagues as she comes to comprehend the scope of her amazing abilities better, but also as she begins to understand the reasons behind tensions within the Squad. There is unfinished business to attend to, and dark times are approaching. Join the GOON SQUAD as there are revelations, dangers and wonders, plus the threat of a mass human sacrifice ruining their evening viewing in THE END OF THE YEAR SHOW.